We were freezing for a reason at Winding Trails in Farmington Sunday - to support Special Olympics Connecticut. Come join us this weekend in Farmington to make a splash and help benefit Special Olympics Connecticut while you do it. The Farmington Penguin Plunge will be held at 10 a.m. Sunday, Jan. 28 at Winding Trails located at 50 Winding Trails. Check-in begins at 8 a.m.
Take a quick plunge into the icy waters with hundreds of other participants. The Penguin Plunge is always a festive atmosphere with music, refreshments and even an awards ceremony. To join in, participants must be at least eight years old and all participants must raise a minimum of $100 for Special Olympics. Click here to register for the Farmington Penguin Plunge or to make a donation to support a participant. 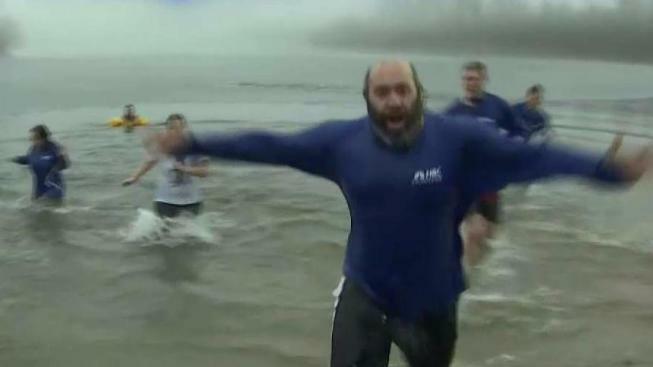 To register for other Penguin Plunges, click here.